Todd River: will we stand by and let the worst happen? Alice Springs wants to be a player in the global tourism business but it is allowing one of its major assets to be destroyed by neglect and vandalism. Vienna has its famous Woods, New York its Central Park and Paris has the Bois du Bologne. Yet Alice’s Todd River, a wild landscape in the heart of the town, is abandoned to arsonists, vandals, litter bugs and remains shut off from visitors whose major attraction it should be. KIERAN FINNANE comments. Deliberately lit fires have exacted a heavy toll on the Todd River and its trees since the warmer weather began. It seems that we are in a brief moment of reprieve but instead of moving to the front foot, the town seems to be sitting back, waiting for the worst to happen. We can hardly expect the destructive mindset of the arsonists to have changed all of a sudden, so why is there not a sense of urgency about doing what it takes to reduce the fuel load in the river corridor? The action that needs to be taken is not rocket science – immediate removal of combustible material around individual trees, possibly linked with fire breaks. Every tree is precious, from the ancient giants to the more recent trees. Their protection is all part of the investment. The Alice Springs Town Council, as trustee of the Todd and Charles Rivers, must step up to its responsibilities. Or is all this talk of connecting the town to the river, our greatest natural asset, mere lip service? 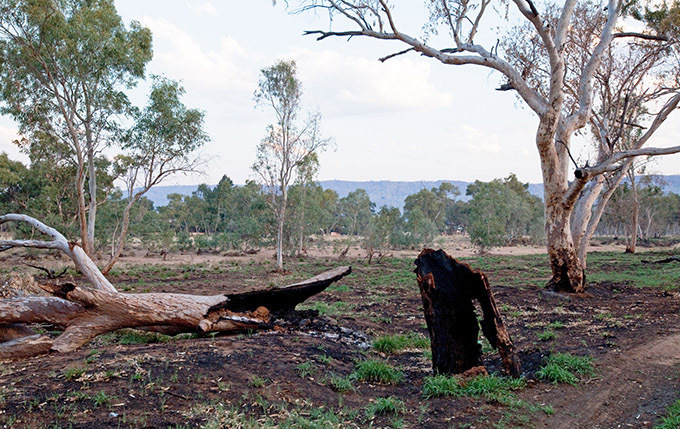 Pictured: Top – The aftermath of Spring fires in the Todd River, south of Tunks causeway. 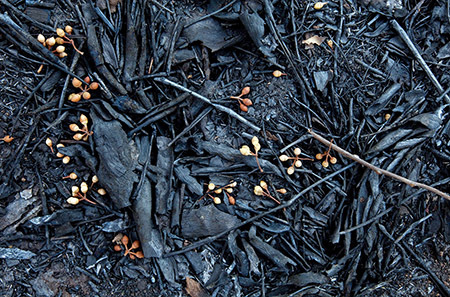 Right – Charred ground beneath a red gum which has shed its seed pods. By photographer and naturalist MIKE GILLAM. In our slideshow MIKE GILLAM tells the story in 12 images. 1. Burnt ground beneath a charred red gum which has shed its seed pods. 2. Long dry grass carried fire to this river giant, hundreds of years old, just downstream from Schwarz Crescent causeway. 3. The scene repeated and the tree left to burn at Charles Creek causeway leading to the Telegraph Station. 4. The scene repeated, the fire once again left to burn on the river bank opposite Warburton Street. This was on September 11. The tree hollow had been burning for days when a group of private citizens put the fire out, carrying buckets of water from nearby houses, saving the tree. 5. The scene repeated at Tunks causeway, leading to Olive Pink Botanic Gardens and the Barrett Drive tourism precinct. The tangle of logs around the base of this devastated giant are forming a protective barrier for new growth. Any removal of them should be handled with great care. 6. The thick trunk was savaged by fire some years ago. The slender branches of regrowth were then destroyed this Spring. How long will the new growth last, with the buffel grass left to flourish all around it? 7. After years of struggle, defeat. The rim of the hole in the ground marks the circumference of the old tree. Recent fire, fuelled by long dry grass, has destroyed the regrowth, burning right down into the ground. 8. In the wake of devastation, the invaders arrive. Bamboo takes root around a still living tree that has little prospect of survival. In the distance buffel grass regenerates, unchecked. 9. It’s not too late to do something to save these trees on the west bank of the river in front of IAD. Immediate fuel reduction is required. This photo and the next two were taken over the last few days. 10. Walking across the river we come to a mid-channel island whose trees are in imminent danger unless the fuel is reduced. 11. Some tree protection has been attempted around this ancient survivor mid-channel. Evidence of such action is very patchy. As new growth takes hold, follow-up visits will be required. 12. The east bank along Barrett Drive. Do we want to lose this magnificent old tree? What do we want visitors to the town to look at when they walk along the banks of the river? Wouldn’t the sight of a beloved wild river, where the country is given the help it needs to look after itself, do our town proud? What about engaging all those on the dole a few days a week to clean out the various grasses to start with. I’ve seen supervised inmates picking up all the rubbish so after rubbish is cleaned up maybe they could clear some grasses as well. We will not just stand by and watch. By the way I`m from Denmark and I could use some help to write an exam. I’m very glad to hear that the Athel Pines still in Alice will be going soon. Having seen what they did in the Finke River around Horseshoe Bend homestead, I cannot find any sympathy for them at all. About the other trees Mike says are listed as weeds by Greening Australia, I have no opinion other than to hope that if they are removed, they are replaced so we can retain a riverside parkland along Stott Tce. That area really is a well-used and much loved pride of the river. Have the seeds dropped into the Todd River by these mature exotics resulted in new growth downstream? Or will they be forced to go just because they are something new, just because they haven’t been here forever and a day? I hope Greening Australia is not listing as weeds any tree not originally a native of Central Australia. I would hate to see a crusading nutter insist Alice lose the citrus and mulberry trees so many of us have in our yards and eat from when in fruit. Ouch! Sadly I knew Hal wouldn’t be able to resist a jibe about the athel pines on our property. But it’s worth the personal embarrassment to secure his agreement (will his conviction last?) that we should act on weeds that threaten the Todd River. WEEDS. In land management terms one of the most dysfunctional sections of the river corridor is described by Hal as an “…improved section … especially that part extending north from the Wills Terrace causeway … It’s also here that on the eastern side the public parklands have become a pride of the river.” (Letter to Ed. Alice Springs News). Unfortunately this perfectly manicured ‘exotic parkland’ on the river-bank is dominated by the following weeds. Himalayan Rain Trees (I stopped counting after 10), Peppercorns, White Cedars and European Nettle Trees. All of these species are listed in “Weeds of Central Australia” (2009) published by Greening Australia. This is really tragic because in the mid to late ’90s the Alice Springs Town Council produced a report, endorsed by the elected members, which called for the gradual removal of these exotics and replacement with appropriate local species. If this had been acted upon the replacement shade trees would be well advanced by now. Instead the mature exotics are pumping large quantities of seed straight into the Todd River drainage system. Re. ATHEL PINES. There are about 10 Alice Springs sites where athel pines persist today and these are the focus of an eradication plan by the Alice Springs Land Care Group. We’ve lived on our property for 15 years and at our own expense have removed approximately 60-70% of the pines. The costs were highly prohibitive and we retained those trees on our front boundary while we considered our options on this heritage-listed property and because they were the only shade we had. Our research indicated the trees were planted during the 1940s – early ’50s and we were relieved to discover there had been NO unassisted expansion beyond the original plantings. We have discussed the issue of our remaining trees with government agencies a number of times and given our permission for their removal. I can advise that funding has been secured to assist with their eradication on our property by the end of March 2012. I agree with you about the necessity to control weeds in the Todd River. Mexican Poppy and Athol Pine would be among the front line offenders. I am sure you would agree that they need to be eradicated wherever they are found in or adjacent to the river system. Hal, when it comes to issues such as weeds I would think that best practice land management of the mere 5 km you talk about is highly relevant to the remainder of the drainage system. According to the Bonzle Digital Atlas of Australia, the Todd River is 272km long. A mere 5km flows through Alice Springs between the Telegraph Station Reserve and Heavitree Gap. I am intrigued by Jane Clark’s question – how long until the river system reaches the tipping point? How many years do we actually have left? For a lot of the old trees, time’s up. The arsonists have done for them. But for the watercourse itself, it will remain a watercourse even if the riverbed fills with silt, spills out into the town and Alice reaches a tipping point. To argue against doing anything is akin to the climate change deniers. Good arguments can be deployed to challenge the science of climate change, but meanwhile the arctic sea ice is shrinking, the glaciers are melting, etc. In Alice Springs, the Todd is being choked by sand islands anchored by couch and buffel, the trees are being burned out by arsonists and the Town Council needs to grasp the nettle and assume control. But then we come to Jane’s other question – who pays? I like the idea of a River Curator – they would probably head up a Todd and Charles Rivers Board with representatives and financial input from the interested stakeholders. The Alice in 10 Todd and Charles management plan still exists and represents much research. I would like to see this document picked up, updated and implemented. But the big issue is – who pays? Where do we obtain consensus, cooperation, a plan and money to make this happen? Another question – how long until the river system reaches the tipping point? How many years do we actually have left? But surely, Mike, not as grim as the present burned-out crime scene that is today so much of our river. Reclaim the river; reclaim the night. Both would benefit Alice Springs. I wonder what the land management thinking of the Town Council is. It might be worth asking them. @3 No, it doesn’t follow, and no, it wouldn’t. Any small boy playing in the mud could work that out. All it might do, is reduce the extra time (measured in seconds) it would take for the water to reach your power points. Go and check out the “biodiversity” in the Todd south of Alice. I always marvel at the stupidity of landlubbers compared to sailors – the latter learn on about day one that you can’t change the sea. Yet when we are on land we think we can change (“tame”) the land, and all will be right. We are fooled when we make miniscule changes here and there, into thinking it’s good and lasting. It never ever is, and rather than creating a “museum”, we could be helping the country to heal itself, by rectifying the many mistakes we have made. If Hal’s comments provide a looking glass into the land management thinking of the Town Council then the future of the Todd River is looking grim. The area of what has become known as Alice Springs is currently experiencing its third social evolutionary change. Probably this evolution is the main reason why we can no longer have a wild bush river. Where we live was first a pristine wilderness, and at that time the river would have truly been a wild bush river. In the first change the area became Mbantua, a word that I understand simply means a meeting place. The changes from what was before would have been minimal. The wild and the bush qualities would have undergone almost no change. In the second change, Mbantua became A Town Like Alice. Those living in Mbantua would have been shocked and resentful, and they resisted. Their river became the Todd River. It was partially tamed by the emergence of an outback town with its connecting causeways and bridges, its roads and railroads. But a small population would have allowed the wild bush river to remain mostly a wild bush river. In the third change, the one we are living through today, A Town Like Alice is becoming Alice Springs, a fully urban multicultural Australian municipality. And the pressures of urban life, not all of them a comfortable experience, dictate that the wild and the bush be tamed and set aside for the healthy growth of the greater municipality. Again there are some who are shocked and resentful, and who are resisting this latest change. There are kilometers of river both north and south of Alice where biodiversity will continue to thrive. Setting aside a mere five kilometres threatens no species’ survival. Waterholes, our billabongs, abound in the ranges east and west of Alice. We have our own recreation and a tourist industry that depends on their good health. To take a whipper snipper to buffel grass to reduce the potential for tree-eating fires is not to make a lawn. If the sand in Heavitree Gap is now one meter higher than it once was, doesn’t it follow that the riverbed upstream from the Gap is also higher? And wouldn’t lowering it allow more floodwater to escape before breaking the banks and flooding the town? Rerouting the Ghan and elevating the highway would certainly increase the Todd’s flow, but where will that money come from? Does anyone still think the culverts at the Taffy Pick crossing are a good idea? The idea of a River Curator certainly has merit, but only if the curator understands the Todd River is a living, vibrant component of Alice Springs and not a museum where the artifacts must be shielded from threatening change. I would also hope a curator would be employed by our Town Council as that is the only democratically elected body in Alice answerable to all the town’s residents. Do our leaders intend to stand by and watch the collapse of the natural order so we can call for tenders to “re-make” the Todd River in the form of say, an English country estate? Just thirty years ago, river management in cities with populations much greater than Alice Springs followed a predictable and familiar course. Urban rivers and creeks were simply neglected and vandalized and finally replaced with concrete drains. In these more enlightened times City Councils everywhere are trying to resuscitate their neglected watercourses and rebuild biodiversity (“wildness”). Yes, there are many reasons, not least of them financial, to retain much of the wild attributes of our river corridors – this does not preclude the extra manicuring of some sections for recreational purposes. The Todd River is too important to be the plaything of amateurs (from politicians to gardeners) to be modified and changed every time a new Council staffer decides they have a vision based on a river from a different climatic zone or a park from another hemisphere. We need best practice in the Todd. We need a River Curator who will lead this community and help us to find a balance between conserving natural and cultural values (our heritage) and developing those recreational uses that are compatible with the imperatives of river management in Central Australia. @4 Why can’t the Todd be a “wild bush river” AND open public space in the heart of an urban setting? Get rid of the buffel, couch etc and illegal activities, and the river will do most of the work. Dredging the Todd will do nothing to help the egress of floods through the Gap, although there may be other reasons for doing it. There are two primary things that cause the problems at the Gap. Firstly, Spencer and Gillen describe the Heavitree Gap as having sand from cliff face to cliff face. Today close on a third of that width is taken up with a rail and a road embankment (the latter was widened considerably in about 1982-84). Secondly, the level of the current Heavitree Causeway is at least a metre higher than the original sand bed of the Todd. This has been the case for a similar time. A major upgrade occurred in 1980, and then repaired after the 1983 flood. While there are some future issues with removing fallen timber from the Todd, it should not be for any one person’s interpretation of aesthetics (perhaps we need a blunt reminder of what we’ve lost). For example, the Casino causeway, installed in dubious circumstances in the same era, increases local flood levels, and any debris (including fallen timber) upstream of it can increase this problem dramatically. The obvious logical answers are to remove/rectify the causes, which are definitely not sand and fallen timber. As a visitor to your city in 2008 from Tonasket, Wa USA, for 9 days, I agree with your pictorial assesement, and conclusions. My wife and I stayed at the Crown Plaza, and at least twice daily walked to town for meals, and part of that reason was to enjoy the Todd River, and its ambiance. To allow the destruction of a tourist draw, is really not in the best interest of the business community, nor even for just the local inhabitiants. I do not know the local problem, so I can’t comment on a solution, but it appears to need addressing. Thanks Kieran and Erwin for your ongoing commitment to relevancy. What a shocker of a fire season – are you aware there was the capability here this year for water dumping on those fires – ignored by the government. I fear we hasten very slowly as a community to become serious custodians of its country. The Todd River in Alice could be a public linear park stretching from St Philip’s in the north to Heavitree Gap in the south. For that to happen, we will have to get over the idea that the Todd is still a wild bush river, and embrace the truth that it is an open public space in the heart of an urban setting. Other municipalities have accepted a similar challenge. Think of the Torrens in Adelaide and the Yarra in Melbourne. Just because the Todd is shorter and drier doesn’t make it any less a river, or any less able to become a public space. Substantial extra funding will probably have to be found if we are to do this. I suspect it will cost more money than Council now has to remove the carcasses of dead trees, keep the grass down, install lights and maintain security. There’s also the possible need to dredge the river so it can take future floods safely and quickly through the Gap. Most importantly, a public education and awareness campaign is needed to discuss what can be done about the current unsatisfactory state of affairs. The Todd is too central to Alice to be abandoned to the arsonists and the social flatliners who have had recent success in taking it away from us. Forty and fifty years ago, before the ubiquitous air-conditioner, some children in Alice slept as often as not in the river as at home on hot summer nights. No parent today would even consider sending their child down to the river for a night’s sleep. Most would caution against it during the day. With good will, community effort and sufficient funding it could again become an area to be enjoyed by all, no matter the hour of day or night.